Sooo 2016 has been a pretty bad year for reading. I’m not even sure what it was, but I somehow had to drag myself through book after book (with few exceptions) and almost lost the love for it. Partly, it’s because I went through a massive life change in early summer, breaking off a six-year relationship and having to move house and build up a whole new life. Then I really enjoyed this new single life and ended up spending a lot more time out and about, training and meeting friends, so there just wasn’t much time for books. I also hit a string of uninspiring books around the middle of the year which didn’t exactly drive me back to the bookshelf looking for more. On the plus side, I started a few books in December that have been absolutely brilliant and re-ignited my book lust. More about those at the end of January, but for now here are the pathetically slim contents of the November and December bookshelf. Connected is a two-part sci-fi thriller that plays out on three levels: on the stage of world politics, where the emergence of a globally connected terrorist organisation threatens all life on earth; on a personal level, where we follow MI6 agent Sam and his wife Ellie as they risk everything in a dangerous plot to save the world; and on a much higher playing field, where a secret overseeing force wages a timeless battle between good and evil with the very existence of Earth at stake. As the story unfolds, every player has to take their side. But with an entirely new brand of terrorism shaking the most powerful nations to their core and unseen forces manipulating events to pursue their own sinister agendas, can Sam and Ellie really pull off the impossible and shift the world off its course of destruction? This book weaves together an interesting mix of genres. It’s a secret agent thriller at heart (think Jason Bourne backed up by James Bond’s tech lab), but the futuristic technologies imagined by the author also firmly places it in the sci-fi arena – and there’s a supernatural element to it as well, plus a good dose of steamy romance. It’s probably not a book I would have picked up, but was too intrigued to resist after meeting the author. A fast-paced read with a visual style and lots of action, Connected comes along like a big-ticket Hollywood blockbuster. Patrick Dennis, master of the hyperbolic character study, takes us on a hysterically funny ride through Mexico City’s American society, where director Leander Starr – Hollywood wonder child of yesteryear and now on the run from Uncle Sam’s tax department, various ex wives and assorted other parties he owes money to – stirs up everybody’s quiet summer retreat with his mission to produce a budget movie that will redeem him with the big studio bosses and his creditors alike. Of course Starr, in the best tradition of Patrick Dennis characters, is a scoundrel and a dreamer, and of course his attempts to string together a masterpiece starring burned-out film industry veterans and produced by the shadier elements of the Mexican business world unleashes chaos on the lives of everyone involved. Brilliantly observed by Dennis himself as an author-turned-character (turned accessory to mischief), this book is both a beautifully rowdy old-school comedy and a merciless look behind the facade of the elite of its era. I haven’t read Alice since I was around six. My mum used to read it to me a lot before I could read. I didn’t actively dislike it at the time, and it didn’t exactly scare me, but I always felt vaguely uneasy about this story. Thinking back now, I realise it gave me a feeling that’s very similar to the way chaos and nonsense make me feel now. So I probably shouldn’t be surprised that I didn’t massively enjoy reading it as an adult, either. I just don’t enjoy logic, so the endless discourse between the various characters annoyed the hell out of me. And I dread chaos. Nonsense is basically chaos, and deliberately nonsensical plots are kind of the worst thing you can do to me with a story. It makes my brain bleed. I love a lot of the elements of Alice that have been adopted into pop culture, but I’ll never be able to enjoy the book. June was all about moving flats, so my contact with books was mostly limited to packing them in boxes, carrying them and buying new book storage. Managed to squeeze in a few reading hours though. 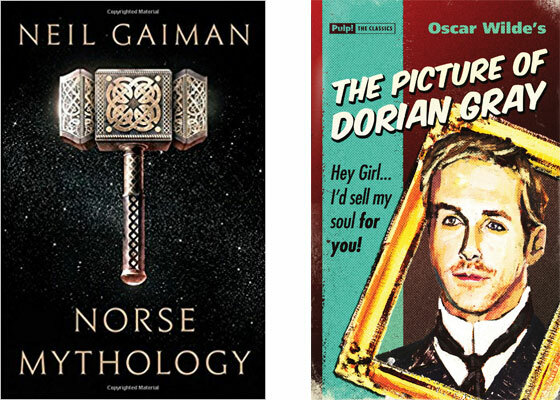 You could say this edition of Bookshelf is all about monsters – human, superhuman and in between. This was my first book by Atwood outside the realms of sci-fi / dystopia and I struggled a bit initially when I realised this was all going to be about relationships – but Atwood’s brilliant style soon won me over. In many ways this is a long and mostly sad story of three women who didn’t have a lucky start in life and put themselves on an even unluckier path by choosing the wrong kind of men. Initially we are led to believe it’s all the fault of the mysterious Zenia – the Robber Bride, the Jezebel, morally decayed to the bone, seemingly born without a conscience, without any sense of female camaraderie – who lies and cheats her way through the lives of these three, bent on stealing their men and ruining their happiness. But as the story of each woman unfolds you can’t help but wonder if Zenia didn’t indeed do them a favour by relieving them of cheating husbands that were only preying on their gullible nature, helplessness or financial security. I still can’t decide whether I found this book uplifting or depressing. True, the women all come out of the encounter with Zenia stronger, if not necessarily happier, but all the female characters are either infuriatingly gullible and spineless, or else the embodiment of all female evil. It’s a bit like a war of different types of femininity in which nobody wins. However, Atwood’s writing style and world view is delightful and irresistible as always, so I still loved this book overall. May 2016: quite possibly my month of the fewest books ever. I managed just three, and one of them is a German book from my hometown that will never be translated, so this month’s bookshelf remains very short indeed. Another recommendation from a colleague and a book I probably wouldn’t have picked up otherwise. I wasn’t blown away by the title story, but some of the lesser known short stories in this collection really got to me – particularly Monte Verita, about two men’s lifelong search for a women spirited away by a mysterious mountain sect, and The Little Photorapher, which explores the darker side of romantic obsession. Most of these stories are quite disturbing in an uncomfortable, somebody-get-her-a-therapist kind of way and all shine a revealing light on the depths of the human psyche. Overall a very enjoyable and captivating collection that definitely made me want to dig deeper into the work of Daphne du Maurier. Another hilarious and totally incredible story from the genius behind The Hundred-Year-Old-Man…, this time about a girl born in a shack in South Africa who goes on to become a figure of significant influence behind the scenes of international politics. As always with Jonasson, it works if you’re prepared to go along on a ridiculous rollercoaster ride without questioning any of the plot twists. If you can do that (and it took me about the first half of the first book to get into the right state of mind), it’s a wonderful story about an improbable heroine, a guy who doesn’t exist, an atomic bomb which technically doesn’t exist either but nevertheless causes serious mayhem around the world, and a loveable cast of royalists, revolutionaries and general weirdos. 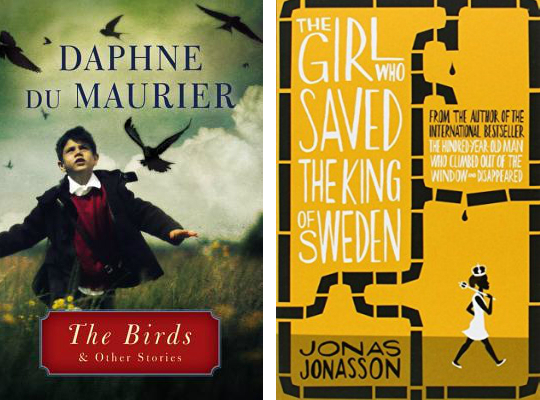 Jonasson writes with wit and a whole lot of heart, and has once again produced a book that feels like a road trip with a good friend – a delightfully Swedish good friend. My reading progress this year continues to be irritatingly slow, but I’ve been working loads as well as making major life changes, so there just wasn’t enough time. And as always in difficult times, I turned to the comfort of Edith Wharton’s brilliant, beautiful writing. This is a little Penguin Little Black Classic that includes two of Wharton’s short stories on the topic of marriage. Mrs Manstey’s View is a short but deeply moving glimpse into the life of a lonely widow that shines with vivid descriptions of New York as seen through the lady’s window. I honestly believe nobody has even described the flowering of a magnolia tree more beautifully than Wharton does in this story. The Reckoning is a moral tale – I would argue – about an unconventional marriage and the dangers of double standards. I found this one a bit uncharacteristic for Wharton, given that she always took a very liberal view on marriage – certainly for her time – and in this story almost seems to backtrack on her ideals. However, as always, she looks deep into the human heart and writes with captivating urgency about the emotional stages we go through when a relationship falls apart. I wish that was the title of an actual book! This headline sums up my reading in February: More Sherlock Holmes & Mary Russell mysteries, and more Ballard. I was already hooked on him after reading The Drowned World [review] and High Rise [review] last year, but Hello America has finally catapulted him right to the top of my favourite authors shelf. Beautiful Apocalypse, by the way, is a song from the latest Kamelot album, Haven – the best metal album of the past year with a gloriously dystopian concept running through it. But back to books: Here’s the February bookshelf. As I mentioned recently, I was converted from sceptic to fan within a few pages of the first Mary Russell book [review] so of course I dived straight into the second volume. While the first book was collection of different cases, which saw Mary learning the ropes, this book is focused on one case: Mary gets drawn into a religious/feminist/political cult led by a charismatic but mysterious woman. When a few too many members fall victim to deadly accidents just weeks after changing their wills to benefit their “church”, Mary suspects that not all is as godly as it seems, and soon find her own life in danger. I enjoyed this even more than the first book because the case is more coherent, creating a pretty exciting page-turner. Mary has become a proficient detective in her own right while building an ambitious academic career in Oxford, which makes her so much more than Sherlock’s sidekick. I’m starting to think, actually, that Holmes is becoming the sidekick in this series – and I have to say I like it! An old archaeologist friend of Mary’s from the first book returns from Palestine with an ancient scroll that may or may not be a letter from Mary Magdalene that could turn Christianity on its head, and is promptly murdered in London. Mary and Holmes, now happily married after their awkward courtship during the second book, go undercover to investigate the potential suspects. For Mary, this means posing as a helpless and naive secretary in the house of a predatory, misogynist colonel and his equally repulsive son. The transformation Mary has to undergo, both in appearance and in character, as she assumes this role really keeps this book going. The attention to detail that King puts into the creation of Mary’s alter ego easily lives up to any disguise Doyle ever came up with for the original Sherlock, and Mary’s internal struggle to stay in character – in which she succeeds brilliantly – prove her to be more than an equal match for the great detective himself. Otherwise, this book drags on a little bit and is probably the weakest in the series so far, but by now Holmes, Russell and their world have become so familiar that the lack of excitement is made up for by the comfort of spending reading time in their company. I got my hands on an original 1967 paperback edition of this and it’s beautiful – a collection of early Ballard short stories ranging from the furthest reaches of outer space to the depths of the human psyche. There’s a slightly depressing undercurrent running through these, giving you a feeling that, no matter whether you’re cast away on a distant planet with no hope of escape, or sitting in our house in a posh London neighbourhood, you’re inevitably doomed anyway. But I like doom, so that’s all right. And the worlds and landscapes of this book, whether in this world our out of it, are gorgeously imagined as is to be expected from Ballard. Overall a very enjoyable read. This book is basically a cross of some of my favourite obsessions: dystopia, apocalypse and the America Dream. Ballard envisions the collapse of the US as a consequence of fossil fuel shortages and climate change in the early 2000s – which, in itself is close enough to home to be terrifying. Then, some hundred years later, he sends an exploration party out of a barely surviving Europe to check on some worrying radiation readings from the American continent, now a largely deserted and barren desert. This group of sailors, scientists and adventurers arrives in a gorgeously devastated New York City and heads west, much like the pioneers centuries before them, following in the traces of the original frontier. As they fight to survive in the grotesque post-civilisation landscape, each of them lives their own version of the American Dream. Soon they find they are not entirely alone there, and giant holograms of all-American heroes in the sky lead them to a glittering skeleton of Las Vegas overgrown by rainforest, where a President who calls himself Charles Manson rules over army of Mexican children and an arsenal of vintage nuclear weapons… I found myself completely hypnotised by this book. Ballard’s vision of this dead continent reverting to primal deserts and jungles is immensely visual; it turns the concept of America into a goddess that lies decaying in the debris of a shattered civilisation and leaves you grieving for everything you’ve ever loved about this country and what it stands for. In my case, that’s a lot – ever since I can remember I’ve been obsessed with America and its pop culture. From vintage cars and skyscrapers to neon signs and Hollywood heroes, Ballard pays tribute to all the little and big ideas we associate with America in a beautiful and disturbing obituary to an icon of our time. Perhaps unsurprisingly, January’s reading journey to dystopia has led me on into the apocalypse. 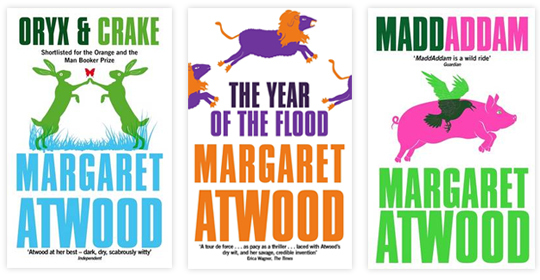 I guess the two often go hand in hand – certainly in the case of Maragret Atwood’s MaddAddam trilogy, which forms the central part of my February reading. New year, new bookshelf! 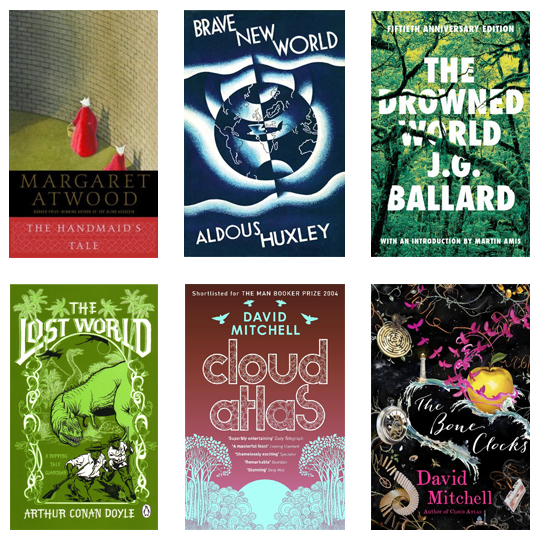 After finally picking up The Handmaid’s Tale I fancied some more alternative reality kind of stuff, so my reading journey throughout January took me from dystopian to prehistoric to post-apocalyptic worlds…and back again. Also as a new feature this year I’m trying to do Bookshelf on a monthly basis. I’ve still got quite a bit of otherworldly reading lined up so expect a similar theme for February. As well as the books below I also read Emily St John Mandel’s Station Eleven, which has certainly been my book of the month and is, quite possibly, already my favourite book of the year. It’s so good it has earned its own dedicated review post. Check it out here – I really can’t recommend this book enough. This summer I went on a bit of an Edith Wharton binge after being stuck on a journey without a book and finding a collection of her complete works on Kindle. I think by now I’ve made my way through all the novels and most of the novellas, but I’ve still got thousands of pages of stories, poetry and non-fiction ahead of me. This is my favourite author after all. Which means I will read EVERYTHING by her. Eventually. So here’s the 2014 addition to the Wharton bookshelf. Now somebody just needs to go and publish shiny editions of all her books. Folio Society, I’m looking at you. It’s Bookshelf time! I haven’t reviewed any books for ages, so let’s do a quick round before I forget all about them. 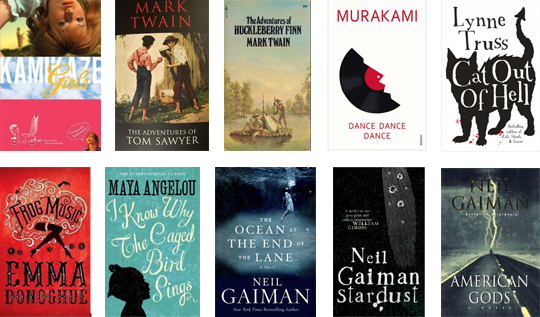 It’s been a good year for reading so far – even though I’ve been spending a lot of time on my new workout routine, I’ve managed to set lots of time aside for books. Happiness all around. Adventures, weirdos, tattoos, gods, satanic cats and potential spoilers after the break. PS: I’m ditching the Amazon links. Explore your local bookshop!